Once you have an idea to building a new home, what do you need to produce the suitable concrete? JZM concrete mixer or JZC concrete mixer? Exactly say, both are OK. But do you know the different between them? 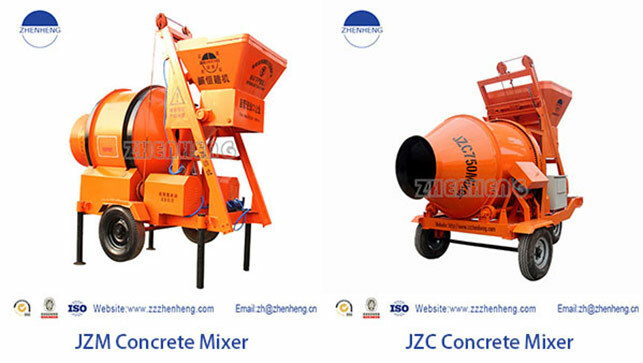 Both JZC and JZM concrete mixer, are all belong to gravity type concrete mixer. Mixing in clockwise and discharging in anticlockwise. JZM belongs to hoisting friction gravity type concrete mixer but JZC adopts gear to mix which is gear chain concrete mixer.The main characters between these concrete mixer Mixing in clockwise and discharging in anticlockwise. This kind of mixer is mainly used for civil use and the working capacity can not compared with industrial concrete mixer. which can mix the plastic and half dry concrete. With perfect performance and convenient to move.